Includes Machupicchu and the "Inti Raymi" Sun Festival, the itinerary varies according to the date of arrival of the guests, without forgetting to visit some of the attractions offered. Living essence in the capital of the Incas, it includes a visit to the festival of the Sun or Inti Raymi and free time to get to know the Inca capital city, Cusco. Cusco in their festivals is an outpouring of artistic expression, the Cusqueños feed on their deep roots to project an eternal alliance with nature and through rhythms and colors, reinforce their commitment to life that extends to visitors through hospitality and reciprocity, which are so typical of Peruvian culture. The festivals reveal the nature of Peruvians, both men and women, their inclination to be sociable and share their parties. Cusco is the capital of the Tahuantinsuyo, Country of the Incas, is the center of the empire of the four regions and the navel of the world. Of this city deployed one of the most remarkable empires in the history of mankind. The Incas expanded in less than a hundred years their borders from northern Quito in Ecuador to the far south of Santiago de Chile. In the eastern direction they reached Argentina. Although the Incas are not well known in the western world, they were one of the greatest ancient cultures known. DAY 1.- ARRIVAL TO CUSCO, THE PARTY OF THE SUN "INTI RAYMI". Arrival in Cusco and transfer to the hotel to drop off your personal belongings. Next, transfer to the Inti Raymi stage. 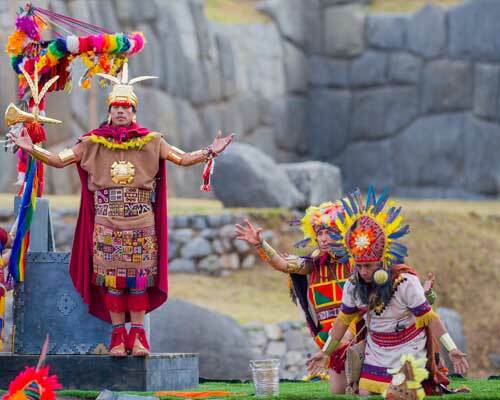 The INTI RAYMI ceremony has three different scenes in three different places, starting at the Inca Temple of Qoricancha on the Avenida. The Sun, then we head to the main square (Plaza de Armas del Cusco), where the second scene takes place and finally ends with the extraordinary and larger scene held in Sacsayhuaman (3 km from Cusco), where we will move by bus. The central staging of INTI RAYMI will be held in the main square of the Sacred Temple of Saqsawaman, where the grandstands have been set up for 3,906 people. All seats are very comfortable for the viewer. The VIP area consists of these 3 grandstands that give a better view of the ceremony. EMUFEC (Municipal Company of Festivities of Cusco) offers other services necessary to attend the Inti Raymi, like the VIP seats, comfortable for the spectator, hygienic baths, first aid services, security police that allow to enjoy this ancestral ceremony with great tranquility. Transfer to the airport and assistance for boarding by our staff. Official Tour Guide in English / Spanish. Excursion to the festival of the Sun "Inti Raymi"
Entrance ticket to Inti Raymi. Personalized assistance throughout your visit in Cusco.